But can two speakers really take the place of five? Can you ditch rear speakers altogether and be happy with a 2.1 virtual surround system? The classic 5.1 home cinema setup uses a disc player and amplifier (sometimes combined in one unit) plus five 'satellite' speakers for surround sound, bolstered by a subwoofer for deep bass. With HD formats such as Blu-ray, you can have up to 7.1 audio channels. Meanwhile, Ultra High Definition TV, the next generation under development in Japan, employs an astonishing 24 sound channels. But do you really need that many sound channels? I mean, really? There's a growing number of systems that are ditching rear speakers altogether to offer a 2.1 virtual surround system. This comprises of a pair of stereo speakers and a sub (the '.1' part of the group). It's not just a budget-end phenomenon either. For consumers seeking extra flair there's Denon's £900 S-302 or Arcam's Solo Movie 2.1, which costs £1,450 before you even add in the cost of the speakers. Onkyo is also getting in on the act with its new HTX 22HD boxes. There is also the 'sound bar' concept, which adds everything except the sub into a long thin single unit that sits beneath the TV. 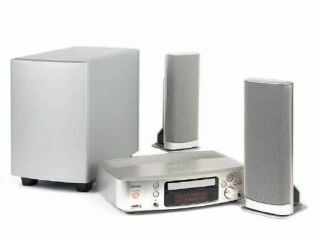 Examples include Yamaha's Digital Sound Projectors, Philips' Ambisound and Denon's X-Space. These use a slightly more sophisticated form of 2.1 virtual surround, employing sound wave diffraction or reflection along with digital processing. Dolby's Andy Dowell told TechRadar why 2.1 packages are beginning to appeal: "As space for internal speakers within flat panel TVs is increasingly at a premium, 2.1-based home cinema systems offer a practical and simple way to achieve an improved sound experience. These systems have opened up the market to an even wider range of consumers." The new wave of 2.1 products are attractive because installation is simpler than with more advanced multi-channel systems. Another benefit is reduced clutter, as Denon's Roger Batchelor explains. "We have identified that many 'potential' consumers for home cinema baulk at the idea of lots of cables and speakers." Some 5.1 packages address this by minimising speaker size. Sony's DAV-IS10 uses five speakers measuring only 56mm tall. However, this approach almost always compromises sound quality, relying on a sub to deliver most of the noise. And you've still got masses of wiring to contend with. Geoff Meads from Arcam says: "For me the 2.1 trend has come from a desire for simpler home decor which is at odds with typical surround speaker setups." "People enjoy good music and good movies, and for enjoyable playback a high-performance 2.1 system can be extremely persuasive. It's perhaps unsurprising then that, with the exception of some large purpose built media rooms, 6.1/7.1 systems are rarely installed." A drawback of 2.1 or virtual surround systems is that it's not always possible to get a sense of true surround sound. The result can be like widely dispersed stereo. It's not just the whizz-bang effects that may suffer from a lack of distinction and accuracy. If you're only using stereo speakers and a sub, then the absence of a dedicated centre speaker means dialogue sometimes loses some clarity. This is especially noticeable with cheaper systems when films throw masses of sound effects and music into the mix. Roger Batchelor adds: "Those who appreciate true surround sound and the best possible performance will not compromise too much. Although the vast majority of systems in the UK seem to be 5.1, there is some renewed interest in 7.1 with some of the latest Blu-ray/HD discs containing discrete 7.1 tracks." A 5.1 system enables you to put speakers in specific positions. The downside is that the two, three or even four rear speakers need cabling to run from the amp. With foresight you can hide this, especially if you are redecorating. Otherwise it's a case of trailing wires and strategically placed rugs. Of course, there are some wireless systems available for rear speaker pairs. But even this isn't a cable-free solution as they need mains power. There is also a performance issue. For Denon's Roger Batchelor, wireless technology will be considered, "only when this can be achieved with no - or very little - loss of sound quality and at an acceptable price." So how much of an audiophile are you? For the time being, the choice between a multi-channel system or a slimmed down alternative comes down to how much you want proper cinema-style audio and whether your room can take the additional bits of tech. Single-purchase 2.1 bundles are undoubtedly aimed at people wanting to bypass their TV's often weedy audio. However, because the minimal-speaker propositions are so compelling, engineers are constantly aiming to improve their performance. Expect to see more of these systems on sale throughout 2008 and into 2009. What sort of surround sound system do you have installed? Let us know whether you're a true-blue cinephile or if you think a 2.1 system is good enough.